Get to know the boss babes behind the brand at Bronzie: Leanne McGuen and Eloise Maryam. This March, the gals at HQhair have been all about empowerment, stayin’ fierce and slayin’ everyday; we fully embraced the theme of #BeBoldForChange this International Women’s Day and appreciated what our mommas gave us on Mother’s day. With our girl power spirit at an all time high, we decided that our Goss With The Boss feature this month just had to be with an inspiring woman! Leanne LeGuen founded the luxury tanning accessories brand, Bronzie, back in the summer of 2014 with her business partner Eloise Maryam. We spoke to Leanne about everything Bronzie related and one thing is for sure, this gal is an ultimate boss babe. Question: So Leanne, what did you do before founding Bronzie? My background is very much steeped in beauty and I opened a salon in my mid twenties. I partnered up with Eloise in 2015. She’s an expert in all areas – celebrity tanner with a long established clientele, a beauty therapist and a teacher. With our combined strengths and areas of expertise, we’re a good fit together! Question: Have you always had an interest in fake tan? Always! A healthy glow is my beauty must-have, but it needs to be safe so I tend to stay out of the sun. My first ever experience was the instant tan from Rimmel. As the market developed, I moved on to St Tropez but now also use other brands such as Fake Bake or Vita Liberata. 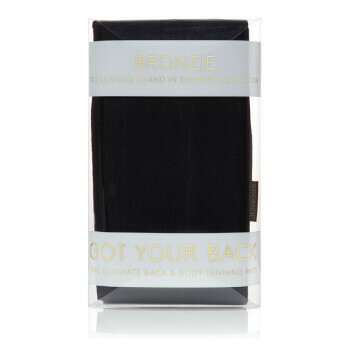 Whichever product I use though, I always apply it with the Bronzie Got Your Back tanning mitt… it’s the only product on the market that ensures a streak-free tan and accesses all body areas, even the back. Shop Leanne’s favourite tans here! Question: What did you feel was missing from the beauty industry that encouraged you to start your own business? I always struggled with what I should wear after my spray tan… Tight fitting clothes can impair a tan and I didn’t want my clothes to be covered in brown gunk! I was also fed up with getting my tan all over my white bedding. I was determined to overcome these problems – for me and other women – and started my business by creating the world’s first after-tanning garment, the Bronzie jumpsuit, that’s designed to glide over the skin and prevent tan lines. It took time sourcing as this was a completely new area to me, and was a massive leap for me financially, but I was adamant that I would get every detail just right… the product even has a breathable underarm area and adjustable drawstring waist so that it fits all shapes and sizes. Question: What has been your biggest “pinch me” moment in regards to Bronzie and its success? In October of last year, the Bronzie Got Your Back mitt won a Silver in the Pure Beauty Awards – Best New Special Innovation category. It’s great to be recognised and this made all of the hard work feel worthwhile. Also seeing celebrities in the jumpsuit never ceases to thrill me – such as Vicky Pattison wearing it on Saturday Night Take Away or, just last week, seeing Susanna Reid wearing it and having it featured in The Telegraph! Question: If you could give your younger self one piece of advice, then what would it be? I’ve learned along the way that the struggle is real, but you have to believe in yourself even when times get tough. Owning your own business isn’t for the faint-hearted, but nothing is impossible with drive and determination. Oh, and if you want something doing, you have to do it yourself! Question: Who is your biggest inspiration and how have they helped you to get to the place that you are today? Without doubt, my mum. She’s supported me from day one and when, in the past, I’ve felt like giving up, she’s pushed me to keep going. Eloise’s mum too has been an absolute rock. She’s never doubted us. Those two women are phenomenal! Isn’t Leanne uh-mazing!? Let us know what you thought of our latest Goss With The Boss blog post over on our Twitter! You can shop everything Bronzie here too!